Old Hollywood glamour and vintage name gems are all coming back full steam ahead in the baby name world but one name that is not on people’s radars is Harlean. The name belongs to Jean Harlow whose full name is Harlean Harlow Carpenter. 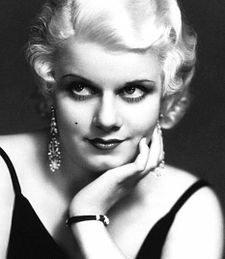 Given to her in 1911 by her parents, the name was seemingly ‘created’ for her by her parents who took her mother’s maiden name, Jean Harlow (which would go on to be her stage name) and amalgamated the two together to get Harlean. Harlean (pronounced: hahr-LEEN), is similar to the masculine Old English surname, Harlan which means ‘hare land’ but there are actually multiple meanings to the name. If analysed through the way Jean Harlow’s parents created the name for her, it might take its meaning from the two names that help to create it - the female Jean is the medieval English variant of Jehanne meaning ‘God is gracious’ while Harlow is an English surname meaning ‘army’. However the name is also of American origin and means ‘dweller by the boundary wood’. Also, if taken by the Harleen spelling variant, the name is of Punjabi origin and means ‘within the love of God’. The name was not used commonly before ‘the original blonde bombshell’, and even Jean Harlow was said to have not even known that was her name as everyone, including her mother, always referred to her as ‘The Baby’ . The name has not gone out of popular culture despite its lack of use as it is a name of a character within the DC Comics Batman series, Dr Harleen Quinzel. The character more familiarly goes by the name of ‘Harley Quinn’ and is the girlfriend of Batman’s arch enemy ‘The Joker’. That might mean that little boys are familiar with the name but I doubt that as a reason not to use it. The character is a little ‘unpredictable’ at times and gets in trouble with the law but in recent storylines she has managed to redeem herself in the eyes of Gotham so hopefully this name does the same as well. The name fits in with the other ‘Ha-‘ names that are popular at the moment like Hadley, Harper and Harlow and it would be a different way of honouring that Old Hollywood Glamour. Harlow made the name not uncommon during her lifetime, with 38 girls given the name Harlean in 1937, the year of her tragic death, though it has never been greatly popular. Five years after her death, the name was not being used at all. In 2011, the variation Harleen was given to 39 girls so the name is in use but it would still be a rarity, especially if you used ‘Jean Harlow’ spelling. Another variant of the name would be Harlene. With Harlow currently sitting at number #621 on the charts, this might be the way to go if you want to honour the Hollywood icon or want a touch of Old Hollywood Glamour.